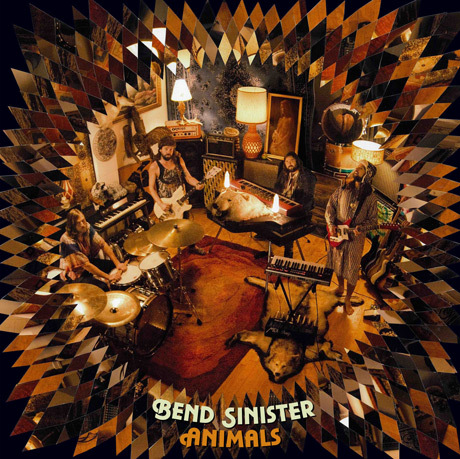 When Bend Sinister released their album Small Fame in the summer of 2012, it had been almost four years since their prior LP. Fans won't have to wait nearly that long until the Vancouver prog-pop band's next album, since they've announced that Animals will drop on March 11 via File Under: Music. The album was recorded in San Diego with producer Joe Marlett (Foo Fighters, Queens of the Stone Age), and apparently the results find the band continuing to expand their sound and drawing on a range of genres. All of the members collaborated on lyrics, chord progressions and songwriting. "With this album we tried to say 'yes' to everything," guitarist Joseph Blood said in a statement. "As much as possible we let go of any preconceptions over how we think we should sound as a band and just let the songs come out." For a taste of what this sounds like, hear the jauntily bouncing, cheekily "Wonderwall"-quoting song "Fancy Pants" at the bottom of this page. Also below, peruse the band's upcoming tour schedule. It includes a number of freshly announced Canadian dates that stretch into the spring.